Q. I'm receiving an error message when trying to access the online library. What should I do? You should first try clearing your browsing history and reopen the browser. You can also try switching to a different browser. Firefox is the recommended browser to access our library databases. Trying to access from work or other school? If your browser reports an error receiving a "cookie," you must enable cookies in your browser. Go to the Firefox drop-down menu under Tools, then Options. 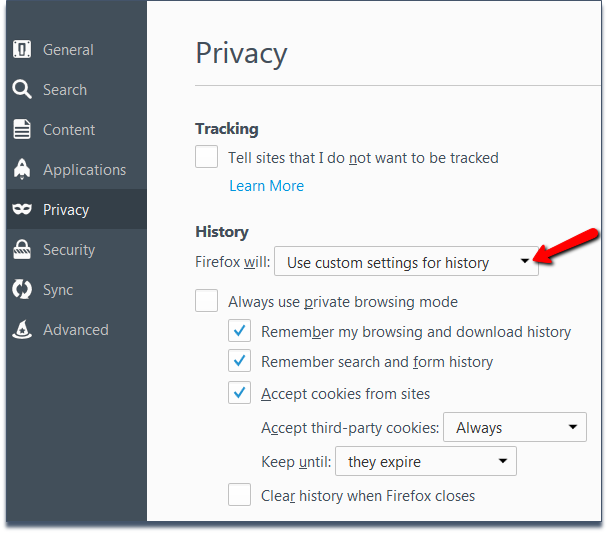 Set History setting drop-down menu to "Firefox will: Use custom settings for history." Check the box next to "Accept cookies from sites" to enable cookies.